Carroll College strives to provide a safe and secure environment for its students, faculty, staff, and visitors. Carroll College promotes a proactive approach to campus safety. The members of this campus community are expected to actively participate in making the college a safe and healthy living and learning environment. We will be adding more information about environmental health and safety at Carroll College soon. 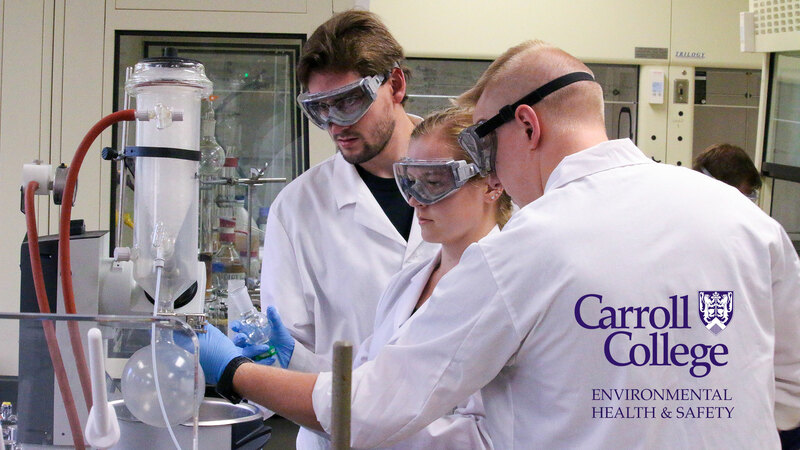 The Chemical Hygiene Plan (CHP) has been developed for Carroll College and is also available to laboratory employees in Room 114 in the Fortin Center, Room 218 in Simperman Hall and the Carroll Facilities Office. The CHP sets forth procedures, equipment, personal protective equipment and work practices that are capable of protecting employees from the health hazards presented by chemicals. Download the Chemical Hygiene Plan.